The 10 Best Milkshakes in West Virginia! There’s nothing better on a hot summer day than a thick, creamy milkshake. Traditional milkshake flavors have been chocolate, strawberry, and vanilla, but today’s milkshakes shops offer many choices of this ice cream delight. And you can grab one in a variety of venues, from old-fashioned soda joints to modern shops with great accompanying burgers and fries. Here are 10 of the best milkshake spots in West Virginia. From its humble beginnings in 1991 to now, Hwy 55 Burgers, Shakes & Fries in Huntington, West Virginia, has become one of America’s favorite burger joints. Not even close to a fast-food restaurant, diners can watch their food being prepared in front of them in the open air-style eatery, and the menus choices are plentiful. They offer fresh-never-frozen specialty burgers, fresh-squeezed lemonade and orangeade, and some of the best milkshakes around. Great food at great prices is what you’ll get from family owned and operated Haught Diggity Dogz in Westover, West Virginia. Besides juicy burgers, hot crispy fries, and mouthwatering chili, hungry visitors can choose from a variety of milkshake flavors made with Hershey ice cream. You’ll have to drive a little to get here, but it’s well worth the trip. The original building was built in 1910, but the food is fresh and tasty at The Corner Shop in Bramwell, West Virginia. If you want old-fashioned friendly service and delicious food, then this is the place for you. Located in quaint surroundings, you won’t walk away hungry with choices of giant-sized burgers, homemade ice cream and milkshakes, and other filling sandwiches, soups, and salads. Fat Patty’s in Hurricane, West Virginia, is a fun place for dining. Good prices on over 20 burgers, cold beer, and creamy milkshakes, you might want to make a reservation because this place is very popular. They just opened two additional locations in Barboursville and Teays Valley. This family-friendly restaurant has large-screen TVs and has been consistently given great ratings on social media sites like Urban Spoon. USA Today voted it one of the “Top 51 Burger Joints” in the country. If you want a truly old-fashioned soda fountain experience, then you have to visit Griffith and Feil in Kenova, West Virginia. Open for lunch and dinner, you’ll get a history lesson while enjoying your food because the place is decorated with great old photos of the Mountain State. Besides drinks like root beer floats and Cokes made with raspberry, strawberry, black cherry, and lime syrups, they have some of the creamiest and thickest milkshakes around. Featuring gourmet burgers and shakes, Tailpipes in Morgantown, West Virginia, has to be on your list of places to visit. Besides the best burgers in the area, they have traditional shake flavors, but you’ll be blown away by their signature flavors like Cinnamon Toast Crunch, maple bacon, and chocolate almond Nutella. This might be a fast food restaurant, but the quality and consistency of the food at Checkers in Nitro, West Virginia, will make you think you’re in a specialty burger and shake joint. Besides wild wings, the best burgers, sweet slushies and smooth smoothies, you’ll find thick and indulgent milkshakes in vanilla, strawberry, chocolate, and banana. From the time you step inside Ellen’s Homemade Ice Cream in Charleston, West Virginia, you’ll feel like you’re stepping back in time. You can find all kinds of yummy frozen treats featured on the blackboard menu, including sorbet, gelato, and sherbet, and if you want to try a special treat, order the Espresso Oreo, raspberry chocolate, or mocha almond milkshake. Cozy, comfortable, and country are the words used to describe The Ice Cream Shop in Davis, West Virginia. Don’t let the cash-only requirement keep you away from this gem of a place because you’ll miss a great experience and surprisingly great food. 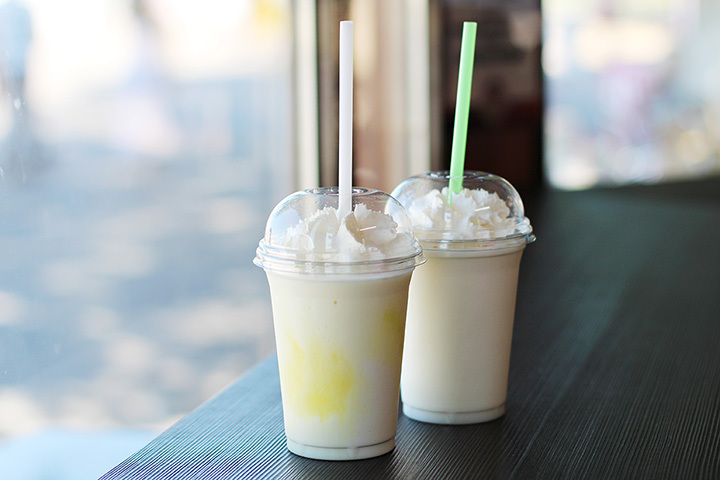 They have smooth and creamy ice cream treats, but the milkshakes are a special delight. Burgers and fries are good, but you need a great drink to top off your meal. That’s exactly what you’ll find at Cook Out in Huntington, West Virginia. This is definitely a place to put on your list if you love milkshakes because they have over 40 flavors to try, like blueberry, peach cobbler, and cappuccino that are available all year round, and seasonal specialties like watermelon and egg nog.